Drawing of real-world issues and with supporting data from industry, this book overviews the technique and equipment available to engineers and scientists to identify the solutions of the physical essence of engineering problems in simulation, accelerated testing, prediction, quality improvement, and risk during the design, manufacturing, and maintenance stages. For this goal the book integrates Quality Improvement and Accelerated Reliability/ Durability/ Maintainability/Test Engineering concepts. 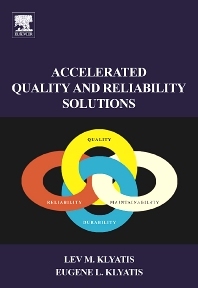 Accelerated Quality and Reliability Solutions includes new and unpublished aspects in quality: - complex analysis of factors that influence product quality, and other quality development and improvement problems during design and manufacturing ; in simulation: - the strategy for development of accurate physical simulation of field input influences on the actual product – a system of control for physical simulation of the random input influences – a methodology for selecting a representative input region for accurate simulation of the field conditions; in testing: - useful accelerated reliability testing (UART) – accelerated multiple environmental testing technology – trends in development of UART technology; in studying climate and reliability; in prediction: - accurate prediction (AP) of reliability, durability, and maintainability - criteria of AP - development of techniques, etc.. The book includes new and effective aspects integration of quality, reliability, and maintainability. Develops a new approach to improving the engineering culture for solving quality and reliability problems. Engineers and researchers who already work with simulation, accelerated testing, failure analysis, maintainability, product and technology management and improvement, quality engineering and management, safety risk assessment, different areas of experimental research, and who are looking for a work that achieve the results rapidly and with high quality. ACCURATE PHYSICAL SIMULATION OF FIELD INPUT INFLUENCES ON THE ACTUAL PRODUCT: introduction, the strategy for development of accurate physical simulation of field input influences, climate and reliability, the system of control for physical simulation of the random input influences, substitution of artificial media for natural technological media. USEFUL ACCELERATED RELIABILITY TESTING (UART) PERFORMANCE: general review of accelerated testing methods, specific accelerated reliability testing technology, technology of step-by-step UART, accelerated multiple environmental testing technology, accelerated vibration testing, accelerated dynamometer testing, accelerated testing of farm and off-highway machinery, determination of the number of tested product, trends in the development of UART technology. ACCURATE PREDICTION OF RELIABILITY, DURABILITY, AND MAINTAINABILITY ON THE BASIS OF UART RESULTS: introduction, criteria of accurate prediction of reliability, durability, and maintainability by results of UART, development of techniques for product reliability prediction on the basis of UART results, prediction of system reliability from accelerated testing results of the components, durability prediction with consideration of expenses and losses, basic principles of maintenance prediction, PRACTICAL ACCELERATED QUALITY DEVELOPMENT AND IMPROVEMENT IN DESIGN AND MANUFACTURING: introduction, basic concepts of quality, basic concepts and practical strategy of accelerated quality improvement in manufacturing and design, implementation of accelerated quality improvement. BASIC CONCEPTS OF SAFETY RISK ASSESSMENT: glossary and terms in quality and reliability solutions, safety aspects of risk control and assessment, relations to transportation problems current situation, basic principles, assessment of a machine limits, risk estimation, risk evaluation, hazard analysis, risk management; about safety, crash simulators, and compliance techniques; trends in the development of some safety problems solution, introduction to human factors. Lev M. Klyatis, PhD, Habilitated Dr.-Ing., Sc.D., Head of Reliability Department Eccol, Inc., has been Professor of Engineering Technology at Moscow State Agricultural University, research leader and chairman of State Enterprise TESTMASH, and served on the USA Technical Advisory Group for the International Electrotechnical Commission, the ISO/IEC Joint Study Group in Safety Aspects of Risk Assessment, the United Nations European Economical Commission, and World Quality Council. Eugene L. Klyatis is a quality manager for industrial companies and an international consultant in quality development and improvement. He is co-author of Successful Accelerated Testing, author and co-author of numerous journal articles and papers presented at American Society for Quality Annual Quality Congresses and SAE International Automotive World Congresses.